55 steel plate, A572 Grade 60 steel plate, A572 Grade 65 steel plate. A 572 Gr.42 steel plate is high strength low alloy columbium-vanadium structural steel grade. A 572 Gr.42 steel intended for riveted or bolted construction of bridges. For more information of A572 Grade 42, please refer them in following. If you want to purchase more yield and tensile steel grade, please check steel grade in A572 Grade 50, A572 Grade 55, A572 Grade 60, A572 Grade 70 steel grade. 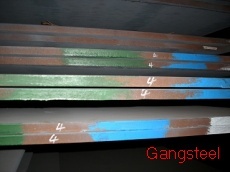 If you need our A572 Grade 42 steel grade in stock, please click Gangsteel Stock.List to find stock steel grade.